Add a little Mexican flavor to your next pizza. 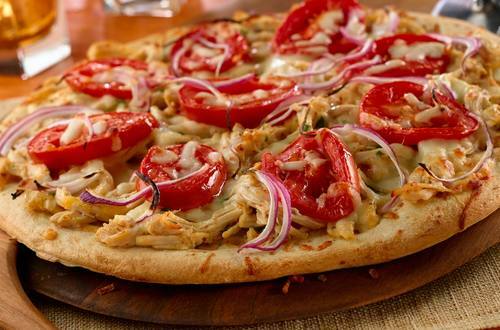 Our Chipotle Chicken Pizza appetizer recipe takes a typical cheesy pizza and gives it a nice does of chipotle heat to elevate your taste buds and keep you coming back for more. 2 In medium bowl, combine chicken, Hellmann's® or Best Foods® Real Mayonnaise, 4 tablespoons mozzarella, cilantro and MiniCube. Evenly spread on pizza crust, then top with tomatoes, onion and remaining 2 tablespoons mozzarella. Arrange on baking sheet. 3 Bake 15 minutes or until crust is golden brown and cheese is melted. See nutritional information for saturated fat and sodium information.